welcome to the world, little girl – Hi, I'm Caroline. 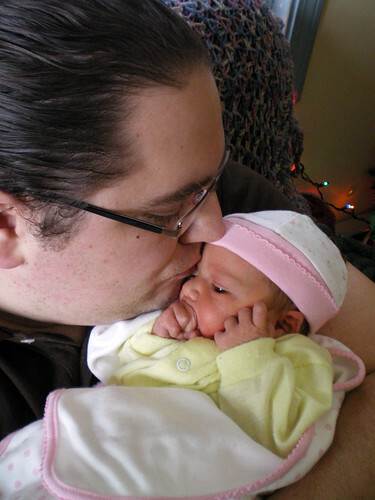 Dec. 20, 2008 @ 7:01 a.m.
Congrats on your adorable, perfect baby girl! Scott and I are so happy for you, Tim, and Ellie! 🙂 We should be in Bangor within the next few weeks and we’d love to see all of you if you’re available Also, we’d like to bring a gift for the little one so if there’s anything you find that you could use more of, like clothes or blankets or anything, let me know! CONGRATULATIONS TO THE BOTH OF YOU! CARO, LET ME KNOW IF YOU NEED ANYTHING…974-6574. YOU’RE A MOMMY NOW. DO YOU NOW WHAT’S FUNNY? THE OTHER DAY I WAS THINKING ABOUT YOU GUYS AND THE BABY AND HER NAME JUST POPPED INTO MY HEAD BECAUSE I HAD REMEMBERED THE NAME THAT YOU HAD CHOSEN FROM A WHILE BACK. MAYBE YOU WERE IN LABOR AND I WAS THINKING ABOUT YA! WE SEND ALL OF OUR LOVE AND SUPPORT AND CALL DAY OR NIGHT!!!!!!!!!!! Her gift is in the works as we speak…. Don’t forget… sleep when she sleeps…. the world will wait…..
congratulations Caro! 🙂 gorgeous name for a gorgeous baby girl. take care of yourself now y’hear! Congratulations!!!! You are blessed. Happy Holidays- she’s the perfect gift. Oh my Gosh, she is the most perfect little person I have ever seen in my entire life. I am soooo proud of you, and I can’t wait to hear all about it! You know, once all the hubbub of Xmas and having a baby calms down. Give me a call when everything is settled, I don’t want to be in the way or cause more commotion, but I am so dying to hold her now that I know she is out in the world! Truly, she is the most beautiful baby girl and am so excited for the two of you. Congrats to both of you! She is adorable, and I’m willing to bet you’ve forgotten most of the labor-I know Meg did the moment Lucy was born. Welcome to parenthood-it’s been great fun for the 11 days I’ve been at it, and I’m sure you and Tim will have a blast as well. congratulations to you! and happy happy new year! CONGRATS!!!!!!!!!!!! We’re so happy for you!!! !